The story of Danny, a young "squaddie," who returns to the UK from a tour in Basra determined to win back his girlfriend. But what greets him on his homecoming batters Danny's already fragile pysche and sends him on a downward spiral of violence and anguish. "Steep Theatre is a Chicago company increasingly known for its uncompromising acting, and Lord knows this particular production, directed by Robin Witt, more than enhances that reputation...[Playwright Simon Stephens] is a phenomenally talented writer, a formative risk-taker." "Take, for example, the current Steep Theatre production of "Motortown"...when it comes to the quality of the acting in Robin Witt's production, there's no better work currently on view anywhere in Chicago." "The hallmark of a Steep production is its ability to fuse the audience to emotion....There is a visceral response. Motortown is Steep's signature move kicked up a notch. The anticipated tension is there but super-charged. It's like walking through a field of land mines holding a grenade...It's an unforgettable trip worth taking." 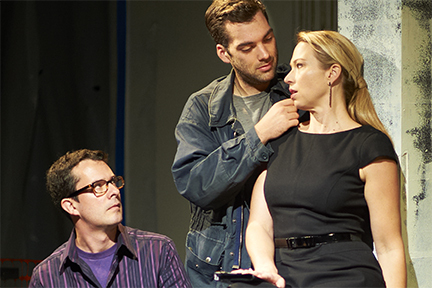 "It is devastating theater, a concisely and potently fashioned play." "...raises powerful questions about the crises of masculinity and the horrors of war....speaks in the harsh eloquence of tragedy." "Director Robin Witt fashions Motortown into a chilling and gripping show, and her amazing acting ensemble is given plenty of flashy moments to show off not only their technical skills, but their complex motivations as well."